Reefscapes tell a story. They paint a picture of the underwater scenes that we get to experience as scuba divers. You can freeze gorgonians as they draw mazes towards the sky, dot blue water with so many fish it begins to look like the milky way above psychadelic mountains, or show the diversity of a reef evolving before our very eyes. Reefscapes are fun to shoot but unlike some other underwater photo styles, using the "spray and pray" method really won't deliver good results. A good reefscape scene has been carefully considered and combines many different compositional elements that attract attention and invite the viewer to spend time with the image. 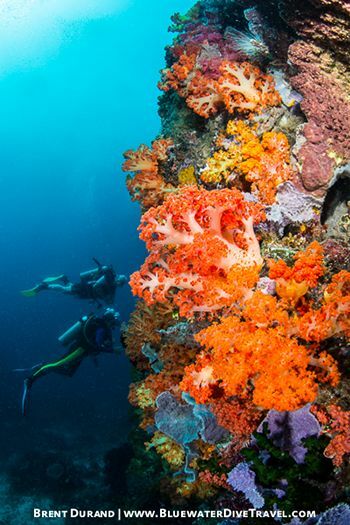 A reefscape scene can include any number of subjects, from corals to kelp to divers to wrecks to the sun and much more. It's up to the photographer to choose the scene that feels best to them. 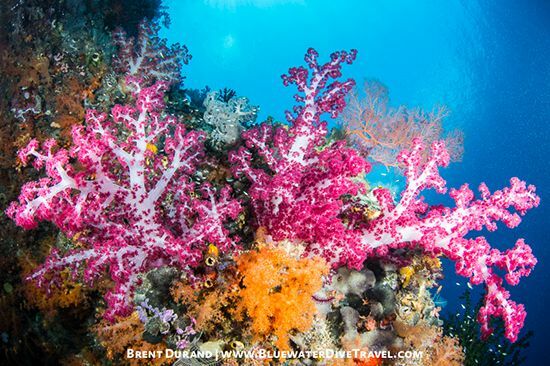 Reefscapes can be shot as mid-range or wide-angle scenes, each requiring different gear, settings and frame of mind. 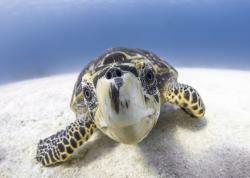 This article covers wide-angle reefscapes. 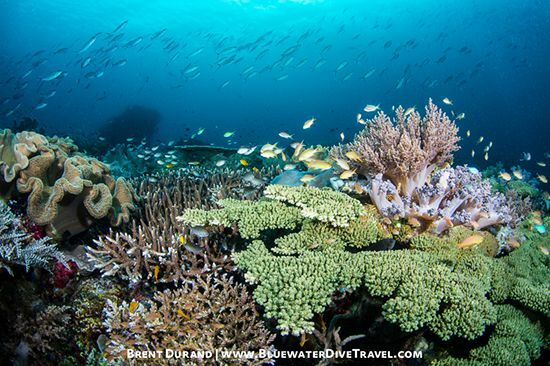 All underwater cameras will benefit from use of a wide-angle or fisheye lens when shooting reefscapes. Compact camera shooters will want a wet lens like the UWL-04 Fisheye Lens. Mirroless shooters can't go wrong with the Panasonic 8mm Fisheye Lens. 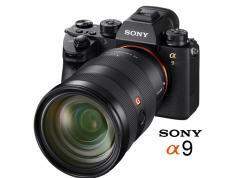 And DSLR shooters will opt for the Tokina 10-17mm, Sigma 15mm or Canon 8-15mm circular fisheye. 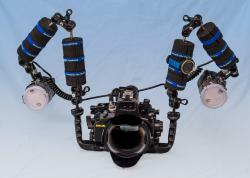 Strobes are essential for shooting underwater reefscapes. As we descend in the water column, color falls off quickly, starting with red. We also start to lose contrast as we get deeper. A good strobe, or better yet, two strobes, will bring that color, punch and contrast back into the reefscape scene. 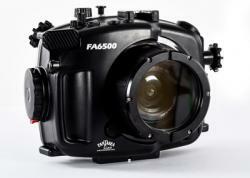 View the best strobes for underwater photography. When shooting reefscape, you'll be including a large portion of the reef in the foreground of the image. To light a scene this large, position your strobes out wide and to the sides of your housing. Note in the photo above that the strobe heads are angled outward. This is in order to reduce or eliminate backscatter, taking advantage of the 100 degree beam angle of each strobe. 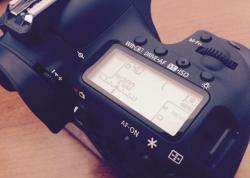 Read our tutorial 'Easy Ways to Eliminate Backscatter'. My dive buddy cruises over to see what I've found. Canon 5D Mk3, Tokina 10-17mm lens, Aquatica housing, 1/200, f14. 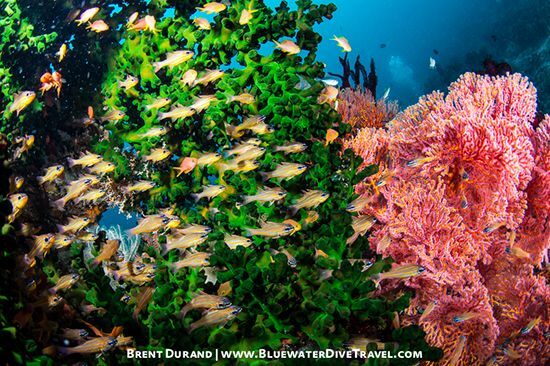 Photo left: Divers drift along a living wall of soft coral. 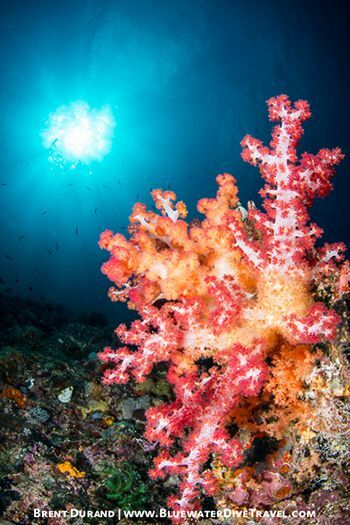 Photo right: Vibrant soft corals reach for the sun. The closer you are to the subject, the larger that subject will appear in the frame. This is the same rule as for shooting macro or wide-angle, so make sure to apply it when shooting reefscapes. Another golden rule of underwater photography, shooting good reefscapes requires shooting up. Why? Because the water color is lighter when we look up (vs. down), creating more pleasing blues (or greens) in the background of your reefscapes. Make sure to try some close-focus wide-angle shots for your reefscapes. CFWA is where your subject is very close to the front of the wet lens or dome port, and can deliver some spectacular results. Yes, your dive buddy can be the perfect finishing element when your composition has a lot of negative space. Depending on positioning, your dive buddy can add a sense of movement or exploration to the scene. Next time you're out shooting reefscapes, make sure to include your dive buddy in some shots, whether discussed beforehand or candid swim-bys. 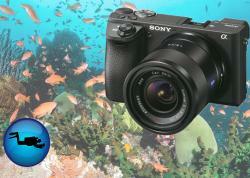 Be sure to read our 'Tips for Dive Model Photography' article. 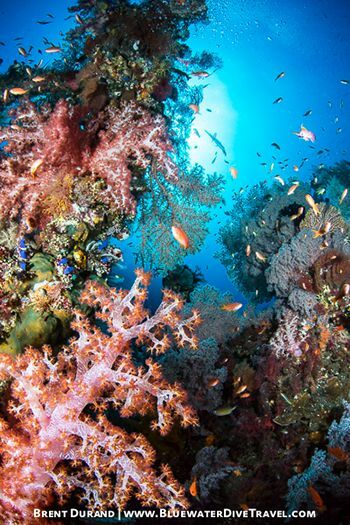 There's no substitution for practice with your camera when it comes to shooting reefscapes. Try to get in the water every week, even if it means night dives and being tired at work the next day. Don't live near the water? Go shoot some landscape photos during the golden hour. Stuck at home with the kids? Shoot some action shots of them! 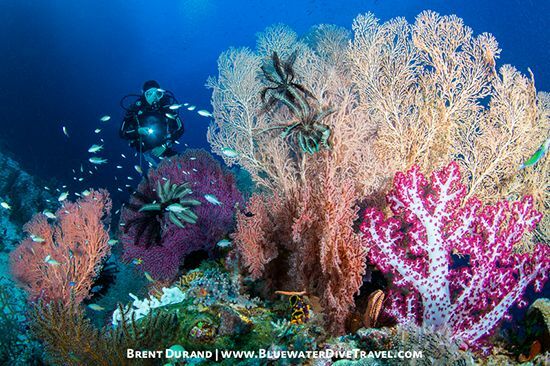 Hard corals, soft corals, fusiliers and reef fish cover every centimeter of ground, showcasing the biodiversity of the reef. Canon 5D Mk3, Tokina 10-17mm lens, Aquatica housing, 1/160, f16. 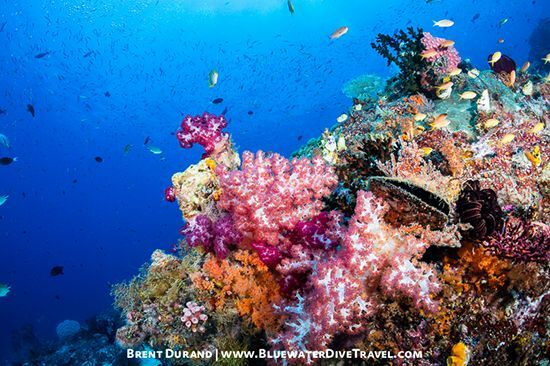 Reeflife creates a colorful display on this sloping wall dive. Canon 5D Mk3, Tokina 10-17mm lens, Aquatica housing, 1/125, f11. 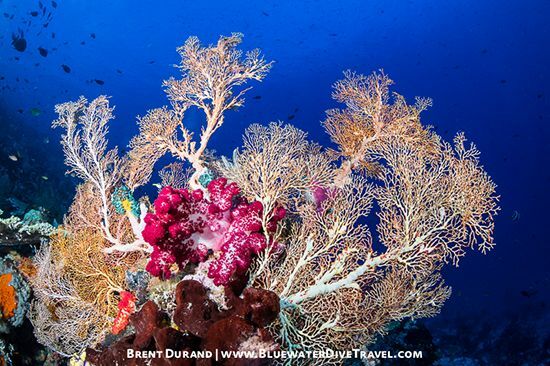 Soft coral finds a cozy home inside the arms of a large sea fan. Canon 5D Mk3, Tokina 10-17mm lens, Aquatica housing, 1/125, f13. 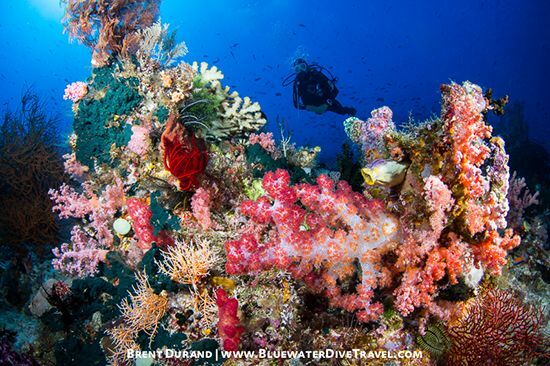 Mid-range reefscapes are another great composition to try on your next dive. Canon 5D Mk3, Tokina 10-17mm lens, Aquatica housing, 1/125, f13. Get close and shoot up to really join the action. Canon 5D Mk3, Tokina 10-17mm lens, Aquatica housing, 1/160, f18. A photographer never stops searching for the perfect shot. Canon 5D Mk3, Tokina 10-17mm lens, Aquatica housing, 1/125, f13. Interested in learning more about shooting reefscapes? Bluewater Photo hosts underwater photo workshops worldwide for learning from the best in the business!